One of the early street gangs active in Seattle, WA, in the 1980s was the United Blood Nation (UBN) allegedly started by “OG Reno”, aka “Problem Child”, “Joker”, “Tiger”, and others. “Reno” did not get permission for this street set named after the predominately black California prison gang called UBN and he got in trouble. The UBN in Washington was predominately Samoan and was based in the Burien area on the Westside. The UBN started in California in the early 1980s by Blood gang members in Jail and Prison. The UBN on the East Coast came much later in 1993. The UBN in Seattle was aligned with Samoan Tribe Pirus in the Rainier Valley and Royal Samoan Pirus in Tacoma. The Mad Pak (MP) was an independent renegade Samoan gang that broke off from the Bloods and was based in the now torn down High Point Projects area of West Seattle and was very active in the early 1990s. MP quieted down after multiple high profile homicides but has been reemerged recently amongst the younger generation. There have also been newer gangs like Young USO Clique emerge. Before the Sons of Samoa (SOS) gang was ever created; Samoans from different neighborhood would gather at Victoria Park in Carson, CA, just south of Los Angeles for "Samoan Flag Day". SOS was first a late 1970s fraternal Samoan social group that later became a gang. Before there was an SOS gang, church youth groups from different neighborhood would often band together for protection against Black and Mexican gangs. According to one source, the Sons of Samoa started on the East Side of Long Beach, CA, in early 1980 by family and friends from Samoa. OG STAR, OG T, OG Big Hug, OG Joe Fob, were a few mentioned. OG STAR was left handicapped in a drive-by shooting. They were allegedly called SOS 10th Street Dogs, several members of the Sui Family, and were sometimes referred to as The Samoan Army. SOS quickly spread to Hawaii, Long Beach, Corona, and San Jose, CA. Salt Lake City, Utah, also reports the presence of SOS. Some of the first SOS Original Gangsters (OG’s) in Washington State were: “The Godfather”, “Stone-1”, “Coconut”, “Big Pepe”, and “Capone”. Stateside SOS are usually Crips and that is the case in Washington State. SOS are well known for using intimidation tactics, extortion, doing drug rip-offs (especially Meth), and murder. Several Samoan gang members were involved in the murder of a couple in the South Park area of Seattle whereby their dog was also killed. It was the first documented case where dog DNA helped convict them. Samoan gangs will fight just about anybody and are also known to fight with rival island Tongan Crip Gangsters (TCG). According to Hawaii-DOC, the SOS street gang died down there, but has shown signs of reviving recently. According to a gangster named “O.G. One-Drop” from 10th Street Dogs-SoCal, USO (United Samoan Organization/or "Brother" in Samoan) started as a prison gang in 1985 in San Quentin. You had to be Samoan to be in it. Fellow USO's were Blawh, Kong, Tuffy, Meke, Bosco, and Steve loia. In 1998, Samoans formed "USO Family" on Oahu. At one time USO was only Samoan on the Islands, but now it's a mixed race Security Threat Group with approx. 200 members in Hawaii and other correctional facilities. The USO Family prison gang started in Haleiwa Prison, Module 2, in 1998 by a group of nine Samoans and grew fast. When HI-DOC started shipping Hawaii inmates to the mainland, USO Family started to appear as a dominant force on some prison yards. According to one source, USO Family has high ranking gang members from major gangs in Hawaii, even some L.A. area gang members. Tongan families also moved from Tonga to the Los Angeles area in the 1970s and some Tongan youth joined gangs. In the Lennox/Inglewood area of California, some Tongan youth initially joined a predominately Black called the Raymond Avenue Crips. Some Tongan kids wanted their own identity and started the Tongan Crip Gang (TCG). In Seattle/King County, WA, some Tongans claim TCG and some belong to the Tongan Crip Family (TCF). The Salt Lake City and West Valley, Utah, area also has a lot of Tongan gangs, especially stronghold in the Rose Park and Glendale areas on Salt Lake City’s west side. There are TCG members in northern and southern California, Hawaii, Utah, and Nevada. Other Pacific Islander groups involved in gang activity may include Filipino gangs. Filipino gangs have been around as long since at least the 50s and probably since WW II when Filipinos started having more contact with Americans. In L.A.’s Rampart District, the Temple Street gang, now a SUR13 gang was once dominated by Filipinos. Virtually every Filipino gang in Los Angeles today has Latino members and in many Mexican-American gangs in L.A. there is at least one Filipino member. Some of the first gangs Filipino gangs in Los Angeles were Temple Street (OLD SCHOOL), Bahala Na Gang (BNG), Tropa Ocho (TRP 8), Santanas (STS), and Sige Sige Commandoes (SSC) some of whom were former soldiers in the Philippines and wear greatly feared for their military training. In the early 1980's a war broke out between 18 Street and STS/SSC. There was also a feud between Avenues 13 vs. Santanas. 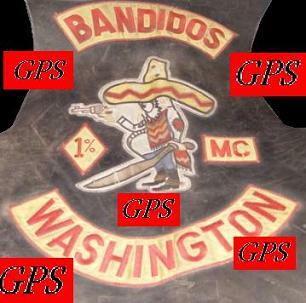 A few other gangs born within the Santanas umbrella would later became enemies with them like Mabuhay Pinoy 13 (MP13). Pinoy Real (PR) is also active in the Greater Los Angeles area. Some of the first Filipino gangs documented in Washington State during the 1970s were the Tulisans (Bandits) and Ungoys (Monkeys) who terrorized the local Filipino community. These gangs were involved in the homicide of two progressive cannery worker union organizers. On June 1, 1981, union leaders Silme Domingo and Gene Viernes were gunned down in cold blood in Pioneer Square close to the International District in downtown Seattle. Three men, one armed with a .45 caliber Mac 10 semiautomatic pistol, stepped through the front door of Cannery Workers Local 37 on South Main Street. One gangster kept lookout and the others searched the building for their victims. Union President, Constantine “Tony” Baruso, said he honored the two dead men after the shocking deaths, but as it turns out actually arranged the hit. Prosecutors could not get the jury in criminal court to agree that Filipino President Ferdinand Marcos conspired to kill the two men. In a move unprecedented in U.S. history, a civil court ruled that Marcos was implicated in the killings via Baruso because of bad publicity concerning corruption that targeted Filipino workers all the way to Alaska and that he should pay restitution for the killer’s act. Baruso died in 2008 in a Washington State Prison. He was 80 years old. Other Filipino gangs active in Washington State have been Bahala Na Gang (BNG), Pinoy Real (PR), Flipside (F*S), 23rd Diablos, and Zimangots (also known as “The Z” 1st, 2nd, and 3rd Generation). There may be Guamanian, Saipan, Fiji, New Zealand, and Marshall Island gang members. The close family ties of Pacific Islanders may cause other PI youth not involved in gang membership to be introduced to the gang and become associates or later full-fledged members. Loyalty to family is often easily connected with allegiance to the gang. The gang may take the place of the village on the islands. Family ties can also lead to difficulty in investigating crimes and prosecuting these individuals. Many times they will provide false alibis for family members. Witnesses may be reluctant to get involved due to their not wanting to be considered a “snitch”, being afraid of retaliation, or outcast from the extended family unit. Gang members will often intimidate witnesses, victims, or other participants with threats of violence if information is given.